It’s definitely soup weather here in Michigan. To me, nothing says comfort more than a bowl of piping hot soup. My husband gets really bored with eating the same soup over and over again, so I’m always trying to come up with new combinations. 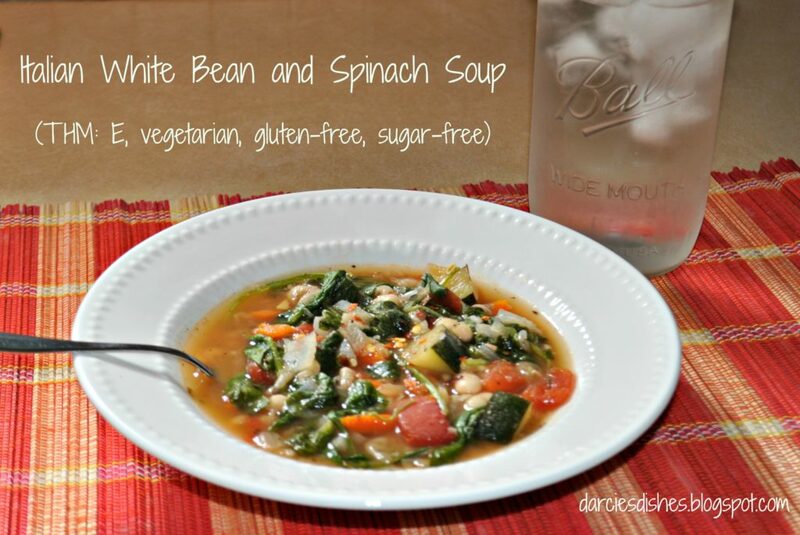 Enter my new creation – Italian White Bean and Spinach Soup! To truly make this a vegetarian/vegan recipe use vegetable broth instead of chicken. I started making my own vegetable broth a few months back and it has been so awesome. I love that it is practically free because I’m using veggie scraps from veggies I’m cutting up for my family. I also get to control how much salt goes in and decide which other seasonings I want to use. I personally like how it tastes versus the boxed variety from the store. This soup freezes and reheats well, so make a double batch and stick in the freezer for a night when you need a quick dinner. I love freezing the soup in these containers. They stack well in my freezer. I used to use ziptop bags but they drove me crazy because they wouldn’t freeze completely flat and kept falling out of my freezer every time I opened it. Make sure you leave a bit of headspace in the containers because they will expand as the freeze. For those of you that follow Trim Healthy Mama, this is an E meal. If you would like some more meatless meal ideas, check out this list! There are 20 to choose from! Let’s get to the business of making the soup. In a large pot heat the oil or butter over medium heat. Add the onion, carrots, and zucchini and sauté until the onion is translucent about 8 minutes. Add the garlic and sauté for 2 minutes more. Your kitchen should be smelling amazing at this point. Do not walk away from the stove while you’re sauteing garlic. It can go from perfect to charred in a matter of seconds. Just speaking from experience. Add the broth, water, tomatoes, beans, and seasonings to the pot. Bring to a boil and then reduce the heat to medium-low and simmer for 15 minutes. Put the spinach in the pot and continue to simmer for 10 minutes. The soup is ready when the spinach is completely wilted. Check your seasonings and make adjustments as necessary. Serve it up and enjoy! If you are going to freeze the leftover, make sure the soup has completely cooled before putting it in the freezer. In a large pot heat the oil or butter over medium heat. Add the onion, carrots, and zucchini and sauté until the onion is translucent about 8 minutes. Add the garlic and sauté for 2 minutes more. Put the spinach in the pot and continue to simmer for 10 minutes. Serve. We tried this tonight, and it got 4/5 thumbs up. Don't feel bad about that last thumb, it was our picky 4 year old, but the 16 month old ate his bowl and his brother's. I only changed one thing, I added the zucchini at the end with the spinach, I like it to have a little firmness. Thanks for the yummy recipe. How would you add chicken? Boil and then shred or cube it? Which would be better – shredded or cubed? I would cook it in a pan separately, then add in the chicken. Would it still be an E with the chicken? Yes, just use boneless, skinless chicken breasts. I made this soup and it was delicious! I had spinach to use up and because I had an open beef broth container, I used it. Also added cooked ground turkey (prepped and frozen). Luckily, I had a frozen bag of onions, zucchini and yellow squash since I didn't have fresh zucchini. Nice recipe which is adaptable!